[Philippe d'Orléans, comte de Paris, Orléanist pretender who served in the American Civil War.] Autograph Note Signed ('L P O', i.e. 'Louis Philippe Orléans), in English, to Henry Walter Bates, Assistant Secretary, Royal Geographical Society. On letterhead of York House, Twickenham, S.W. 25 November 1865. 1p, 16mo. In fair condition, lightly aged and worn, folded three times and laid down on part of a leaf from an album. Reads: 'Nov. 25th. 1865 | the Comte de Paris | presents his compliments to M. Bates and sends to him the enclosed certificate of Dr. de Mussy as a candidate for election to the R. G. S. | L P O'. Henry Walter Bates (1825-1892), naturalist and explorer served as Assistant Secretary of the Royal Geographical Society from 1864. Noël-Francois-Odon Guéneau de Mussy (1813-1885) was a French physician. [Ordre de Notre-Dame du Mont-Carmel et de Saint Lazare de Jérusalem.] Paris, 16 July 1700. See A. de Marcy's 'Liste des Chevaliers' (1875), which reproduces from the registers the notice of the admission into the order on 16 July 1700 of 'Jacques Giraud de Moucy, cy-devant mousquetaire, commandant des gardes de S. A. R. Madame la duchesse d'Orléans'. On a 37 x 51 cm piece of vellum, folded three times into a 30 x 12.5 cm packet. In good condition, clean and crisp. 1p., 12mo. In good condition, on lightly-aged paper. The letter reads: 'My dear Sir, | Only one Word to let you know how deeply I feel your untimely loss and to ask you to be by Mrs. Lewis, her daughter and all your people the interpreter of all my sincerest sentiments of regret. | Yrs. truly | Duke de Penthièvre'. [ Ferdinand Philippe, Duke of 'Orléans. ] 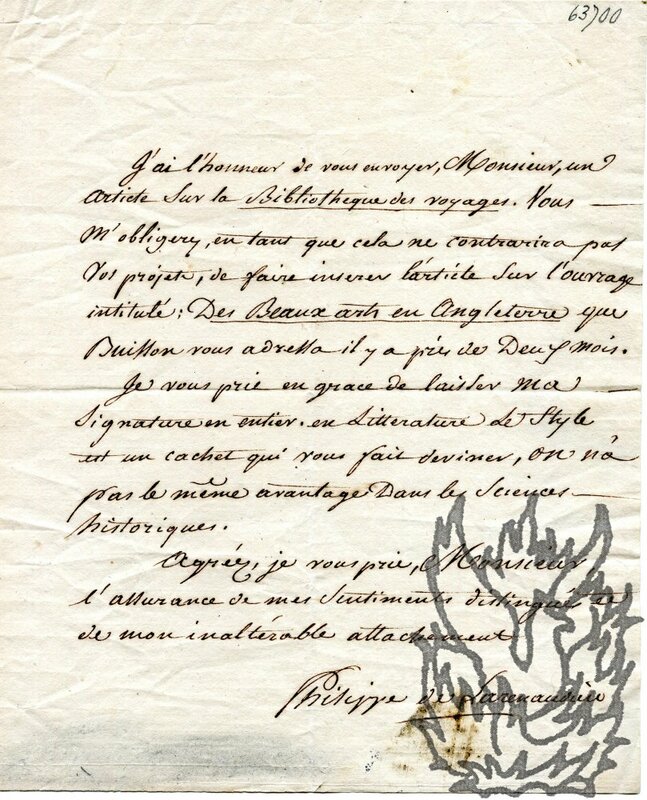 Autograph Letter Signed ('Ferdinand Philippe d'Orleans') to a general, pressing the claims of the Napoleonic War veteran Colonel Joseph Simon Pozac to the Croix de Commandeur of the Legion d'Honneur. 1p., 12mo. Seventeen lines of closely-written text, with postscript. Slip of paper with biographical note in contemporary hand attached. He begins by stating that he has sent the 'differents papiers' of which he spoke that morning. He next reminds the recipient of 'l'affaire du brave colonel Pozac', regarding which 'vous avez bien voulu charger d'etre mon ambassadeur auprès du maréchal'. Pozac obtained the 'sabre d'honneur comme sr.
[ Pierre-Louis Caron de Vernon, French art collector and inventor. ] 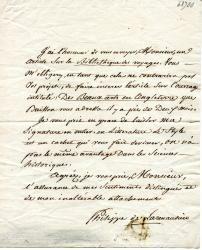 Address, in French, signed 'Caron de Vernon', 'A Son Altesse Royale Monseigneur le Duc D'Orléans', presenting him with two marble statues. 2pp., folio. On bifolium. In a contemporary hand in margin of first page: 'Mr. Leblond' and a reference number. The document begins: 'Pre. Louis Caron de Vernon a eu l'honneur de servir sous les ordres de V: Altesse Royale en 1793 dans le 73 Bataillon de Paris, et au camp de Ste. Margueritte celui d'offrir son pain a V: Altesse, qu'Elle volut bien daigner accepter, en recommandant de lui rappeller cette circonstance dans l'occasion. [Printed broadside, in French, relating to the estate of King Louis Philippe.] Faits à l'appui de la défense du droit de propriété Contre les décrets, du 22 janvier, 1852. 2pp., folio (approximately 41 x 21.5 cm), in double column. Fair, on aged paper, creased and with outer margin trimmed. Tipped-in onto leaf removed from album. The first column introduces the problem, and is followed by a 'Lettre de M. DUPIN ainé, au Prince Président de la République', dated 'Paris, ce 23 Janvier, 1852'. This is in turn followed by a letter 'Au Prince-Président de la République', Paris, 26 January 1852 by five 'Les executeurs testamentaires du feu Roi Louis Phillippe'. They are: Dupin, Duc de Montmorency, Comte de Montalivet, Laplagne-Barris, Scribe. Autograph Letter Signed ('Philippe de Larenaudière'), in French, to unnamed male editor of a journal. 4to, 1 p. Fourteen lines of text, on the recto of the first leaf of a bifolium. Text clear and complete, on lightly aged and creased paper. Slight staining at foot of text (affecting part of signature), and on the reverse of the second leaf of the bifolium, which is docketed 'la renaudié | A. S.' He is sending an article on 'la Bibliotheque des voyages'. Asks that the article on the work entitled 'Des Beaux arts en Angleterre', 'que Buisson vous adressa il ya prés de Deux mois', be inserted. 'Je vous prie en grace de laisser ma Signature en entier. Autograph Letter Signed ('P. Sainton') in English to unnamed female correspondent. 24 September 1877; on letterhead 'Conteville, pres Boulogne-sur-mer'. Fragment of Autograph Letter Signed. On piece of grey paper roughly 10.5 x 13.5 cms. Creased and with some evidence of previous mounting on reverse. Docketed 'From general Reibell commanding in the Haut Rhein - who cut his way into the Tuilleries, & saved Louis Philippe & his Queen; commanded the Cavalry in Paris afterwards, on the jour des revoltees [sic] Etc. -.' Reads 'Je ne regarde pas la partie comme perdue, tout faut, nous causerons de ce qu'ils faudras faire | Tout a vous | G[ener]ale Reibell'.